(BPT) - When it comes to mealtime, are you thinking fish? You should! Fish is the premiere natural source of omega-3 fatty acids, which are not naturally produced by the body and, therefore, must come from food. If you’re an expecting or breastfeeding mom, it’s even more important to eat fish because it’s a vital staple for optimal brain and eye development in babies, as well as brain and heart health for moms. Eating two to three servings of fish each week has also been shown to have a positive effect on developing babies’ and children’s IQs. Unfortunately, many mothers avoid eating fish based on fears associated with misinformation. According to the 2015-2020 Dietary Guidelines for Americans, healthy eating patterns should include at least 8 ounces - or two servings - per week of a variety of seafood because it is an important part of eating patterns that contribute to a healthy heart and weight. Seafood also provides powerful nutrients including brain-building omega-3 fatty acids, protein, B vitamins, vitamin D, iron and selenium. In addition, eating seafood during pregnancy contributes to better health for babies. Currently, the average American eats about half of the recommended amount of seafood, and the average mom-to-be eats less than a quarter of the recommended amount each week. If you’re not eating as much fish as you should, don’t worry - making a shift to add more seafood to your diet is easier than you think. Just substitute fish for meat, such as in a taco, or add it to a pasta dish. Fish can be the main course of a quick weeknight dinner, a pack-ahead lunch or even a weekend brunch. 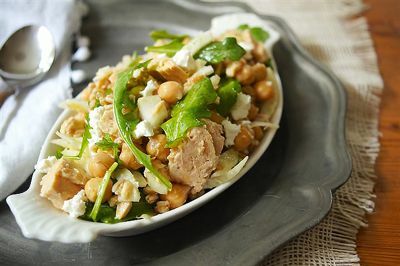 Fish is so versatile, you can easily add it to pasta, rice, tacos or a scrumptious salad, like this easy-to-make farro, tuna and fennel salad with crumbled feta. Transfer farro to a large bowl. Add tuna (flake with a fork), chickpeas, fennel, arugula, olive oil, lemon juice, lemon zest, cumin and salt. Toss well. That’s it! A quick, easy recipe that serves as a lunch or a light supper for four or as a side dish for six with just 310 calories and 12 grams of fat. It boasts 18 grams of protein as well as omega-3 fatty acids, too. To learn more about the benefits of seafood and find other healthy, easy recipes you can enjoy every day, visit www.GetRealAboutSeafood.com.